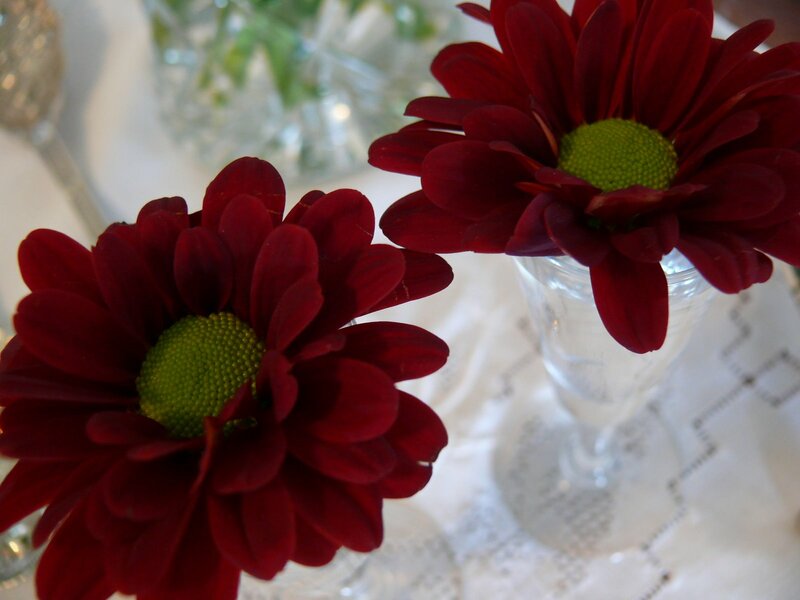 These two deep red chrysanths have a story !! Yesterday in the carpark at the shopping centre where I dashed to whilst Bradley was doing his karate class, I watched a young chap stuff two bunches of flowers into a backpack and proceed to climb onto his motorbike and …. off he went … squished flowers sticking out the top! Once he had left I notice two lonely blooms lying on the tarmac. 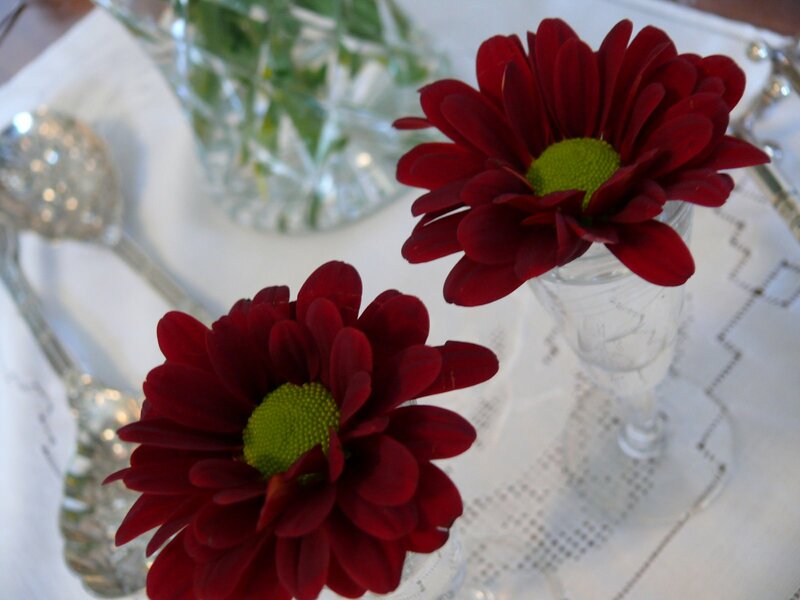 Rescued them from imminent squishing under a car’s tyre and placed them in tiny crystal liquor glasses … which I often use for odd little blooms that have lost their stalks .. for my Valentine’s table! Pity .. I’m all on my own – hubby is away visiting his Mum in Hermanus where they scattered his Dad’s ashes in the sea today, and Elaine and Bryan are going out for a romantic dinner for two!! Don’t mind, really … I have my glass of good red wine at hand, and braai (bbq) left-overs!!!! Hope the young chap’s girlfriend loved and appreciated the flowers !! Wonder how many more blooms flew off as he sped away! Happy Valentines Day.I have a scooter and riding it has become more of a lifestyle than a saving of petrol. Some days I feel weird getting into my car on a rainy day. I know the kind of problem this guy had. You should have seen me the other day. I stopped at Fruit and Veg on the way home and bought a watermelon, a big one. Had to put it between my feet on the scooter to get it home and hope that I wouldn’t have to stop suddenly. LOL Firefly!! Can just imagine you balancing the large watermelon between your feet whizzing around corners! A romantic story!!!!!!!!!!!!!!!!!!! Love it and hope you enjoying them today. I hope you enjoyed your Valentine’s day, even though you’re all alone! I enjoyed your blog and your pictures again today, I had a lot of catching up to do!